Samford’s School of the Arts will offer several events during Homecoming weekend, Oct. 11-14. 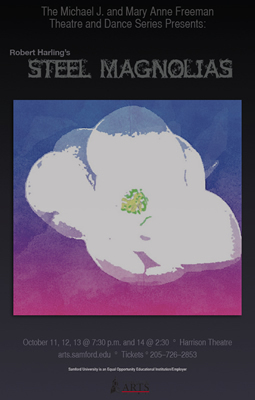 The Michael J. and Mary Anne Freeman Theatre and Dance Series will present “Steel Magnolias” in Benjamin F. Harrison Theatre Oct. 11-13 at 7:30 p.m. and Oct. 14 at 2:30 p.m. Robert Harling’s beloved American play tells the story of a group of friends in a small Louisiana town and their endurance through love, loss and renewal. At once hilarious and heartbreaking, this is a production not to be missed. Tickets are $12 (adults,) $9 (55+) and $6 (students/children) online or at (205) 726-2853. • Homecoming Vespers, featuring A Cappella Choir and University Chorale, Oct. 12 at 5:30 p.m. in Reid Chapel. • Morning Sing, featuring A Cappella Choir, Oct. 13 9:30 a.m. in Reid Chapel. • Guest Artist Exhibit: Gum Bichromate and Other Photographs by Jonathan Purvis, in Samford Art Gallery, 9 a.m.- 4 p.m., Monday-Friday.